Houston, TX: A pencil torch emitting laser light turned into a magic wand and the magic of light brought to life the ever green story of a world famous monk, known as Swami Vivekananda. The expectant audience, unfamiliar with the technique of laser show, was perhaps looking for a miracle and miracle, indeed, occurred as ships sailed, trains arrived, men and women walked and children played, all walks of life continued , bound and shaped by sheer light.. The art of cartoon and animation reached its zenith in the hands of the reputed Laserist Manick Sorcar. The laser documentary on Swami Vivekananda is on a three-month tour across the U.S., after its phenomenal success in India last year. The U.S. tour premiered in Denver, Colorado on August 24, and ends in Portland, OR on November 24, 2013. “Swamiji,” the Laser Show, was staged at Stafford Center near Houston on Sept. 8 as a part of the SEWA International USA fundraiser, under the auspices of the Houston chapter. Stepping ahead of time, Sorcar has experimented with laser animation. His latest animations are created with cutting-edge laser technology, where he manipulates the strong, pencil-thin ray of light to race along a predetermined path to create a moving animated figure. Although called a laser show, “Swamiji” crosses the boundaries of a traditional laser show, combines three dimensional visuals effects, and stagecraft with a short interlude of real people. The well-researched 1.5 hour multi-media show dominated by laser light began with “Vandana,” a laser and live prayer dance dedicated to the Holy Trio of Ramakrishna Paramahamsa, Saradha Devi and Swami Vivekananda. A gust of wind flips the pages to the beginning, when the old book and its pictures come to life with vibrant colors of laser animation and start the story on Swami Vivekananda from his birth. The dream came true when he received an invitation from the Ramakrishna Mission Institute of Culture, Kolkata, India, to build a laser documentary on Swami Vivekananda to celebrate the 150th birth anniversary of the great monk. There was no looking back. He completed the storyboard and started on laser animation and 3-D special effects, which took another year to complete. In the show, he implemented a dozen of color lasers for graphics, animation and atmospherics synchronized with intelligent lighting, hazer machines, and surrounding sound system to present the mystical life story of the great monk of the nineteenth century in the state-of-the-art lighting of the 21st century. 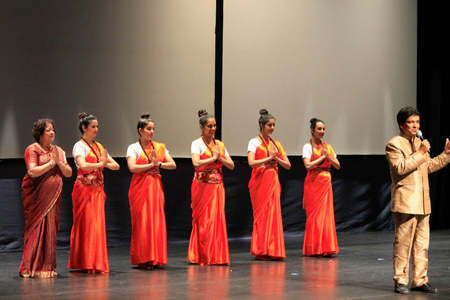 “Apart from the very impressive display of laser technique, what gladdened our hearts was the accuracy, authenticity & the appropriate nature of incidents, music, narration, etc….The Western audience would appreciate the show even more because Swami Vivekananda’s message of harmony has been beautifully highlighted….” said Ramakrishna Mission, New Delhi, after the show. His love for animation started as a simple idea to make learning fun for his two little daughters. His laser animation includes Sorcarscope where laser animation is combined with live action on stage. Now, Sorcar is experimenting with laser to produce a full-length movie. At the Houston show, Rahul Pandit emceed the event. Amit Mishra, Manju Gupta, outgoing president of Sewa International, Houston chapter, and the president of Houston chapter, Sarojini Gupta, briefly spoke on the birth, growth and expansion of Sewa International. What began as a small, local voluntary group to help the victims of Hurricane Katirna, has evolved into an international organization, with 37 chapters in the U.S., Manju Gupta said. Saroj Gupta traced the exponential growth of the organization in Houston and highlighted its current projects. Sewa International has worked towards setting programs through which the Bhutanese and low income communities of Houston can benefit . The Refugee Empowerment project aims to empower them with the skills necessary to live in the modern urban environment. Volunteers of the Sewa Houston chapter consists of college students and people hailing from various professions that regularly provide assistance to the refugees. Get Inspired Houston is a summer internship program offered by Sewa International’s Houston chapter which allows young adults to explore and innovate new ideas geared towards the welfare of refugee communities. Over the past 4 years GIH has provided a platform wherein young minds identify, create and implement projects which lead to social change in our community, all while working alongside a grassroots, non-profit organization. Under the new Family Services project, Sewa aims to provide physical and online aid and references for fellow community members during times of need such as illness, accident, injury, and bereavement. In the first five months of the program, Sewa has helped a dozen families, Gupta said. Through Sewa Local Events, over 120 volunteers have committed their time serving various local organizations including the Houston Food Bank, Texas Children’s Hospital, Star of Hope Mission, Habitat for Humanity, and the Houston Zoo. Sewa International Houston was conferred with the prestigious 2013 Youth Service Challenge Medallion for outstanding community service by Jefferson Awards in a ceremony held at City Hall in Houston recdntly. To get involved, please visit houston.sewausa.org or contact houston@sewausa.org or 281.909.SEWA.